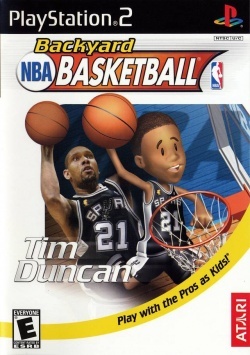 Game description: Kid versions of NBA stars join the Backyard Kids in Backyard Basketball. Play as your favorite NBA players, including Yao Ming, Tim Duncan, and Kevin Garnett in pulse-pounding three-on-three basketball action. While these NBA stars and Backyard Kids are small, they can still hit devastating jump shots, grab opening tips, nail buzzer-beating three-pointers, and perform super dunks. With a Season Play mode, awesome power-ups, and all-new 3D environments and details, backyard basketball never looked so good. This page was last edited on 5 January 2017, at 17:54.